That is…if you let it. 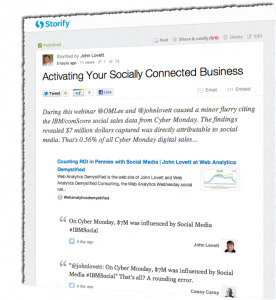 During our webinar yesterday Activating Your Socially Connected Business, Lee Isensee (@OMLee) and I caused a minor flurry on Twitter when I Tweeted about the results Lee showed from the IBM/comScore social sales data from Cyber Monday. The findings revealed that $7 million dollars captured on Cyber Monday 2011 in online sales was directly attributable to social media. This makes up 0.56% of all online sales on Cyber Monday 2011. The skeptics were quick to pounce on the paltry figure, with #WhoopDeeFrigginDo’s and “rounding error” rhetoric (see the Storify.com synopsis). And I agree, that half a percentage point, by anyone’s count isn’t a whole lot of impact. Even when it equates to $7 million bucks in a $1.25 billion dollar day of digital shopping. However folks, remember that all online sales last year represented just 7.2% of holiday cha-chingle in retailers’ pockets. According to comScore’s numbers that’s $32.6B in digital business over the 2010 holiday shopping season. Yet, how many of the total $453B in last year’s holiday sales…or this year’s forecasted $469B in holiday sales…were/will be ***influenced*** by online channels? The answer is a lot. According to research firm NPD, 30% of all holiday shoppers plan to buy online this year, with the numbers even larger for high income households. Further, a full 50% of shoppers will turn to the Internet to research products prior to buying this year. And this that doesn’t include another 20% that will rely on consumer reviews and 4% who will turn to social media for their pre-buying intel. As we know, many of these shoppers will hit the stores with smartphones in hand, ready to get info or tap into their social networks as necessary. My point is that if you’re so narrowly focused on social media that the only reason you’re in it is for the money…then you’re missing the point. Social media is today – and will be tomorrow – an enabler. It’s a method to engage with people on a meaningful level and to allow them to engage with one another. As a brand, if you can’t see this then you’re totally missing the point. It’s not all about the Benjamin’s. Social media ROI is important, but trying to pin everything down to bottom line metrics will have you “blue as hell” when it comes time to tally the numbers. Instead, work to identify other Outcomes for your social media objectives that ***don’t have*** direct financial implications, but that ***do have*** business value. Demonstrating that your social channels reduce call center costs, elevate customer satisfaction, or simply drive awareness of your in-store promotions will deliver value deep within the business. I’m all for generating ROI from social media activities and making direct revenue correlations when they exist. Yet, in today’s world, social media isn’t just about the bucks. It’s a means to deliver better experiences for the many people who turn to that channel. If you’re interested in learning more about Activating Your Socially Connected Business, download Chapter 3 from Social Media Metrics Secrets, courtesy of IBM.